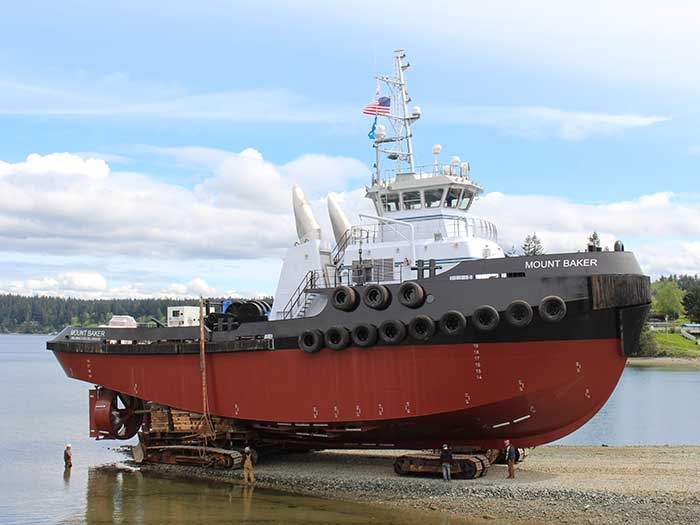 MAY 5, 2017 — Nichols Brothers Boat Builders, Freeland, WA, has launched the M/V Mount Baker, the first of two 120′ x 35′ x 19′-3″ twin-screw tugboats for Kirby Offshore Marine (KOM). Vessel operators are still very much focused on reducing fuel consumption and lowering emissions. 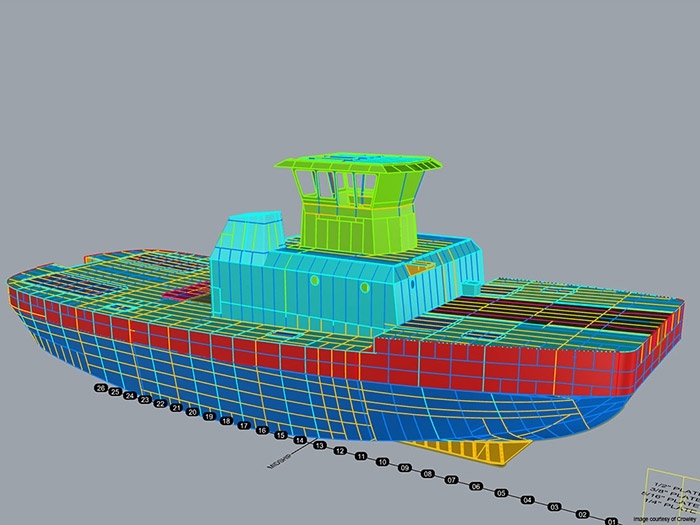 Collaboration early on in the design of a new vessel and its construction between the vessel owner, naval architects, shipbuilders, and propulsion manufacturers can payoff in optimizing the vessel’s hull, reducing costs of construction, and lowering operational costs during a vessel’s lifetime. Nautican’s foundation was built on efficiency. More than 40 years ago, company founder Josip Gruzling pioneered the use of hydrofoils to increase the efficiency of tugs and barges. Today, Nautican engineers and manufactures hydrodynamic solutions, including patented Integrated Propulsion Units, High efficiency nozzles and propellers, high aspect ratio triple rudders, pre-swirl stators, and also hydralift skegs for barges. It says independent tests show that its propulsion system solutions increase power and maneuverability, while significantly reducing fuel use and maintenance needs. 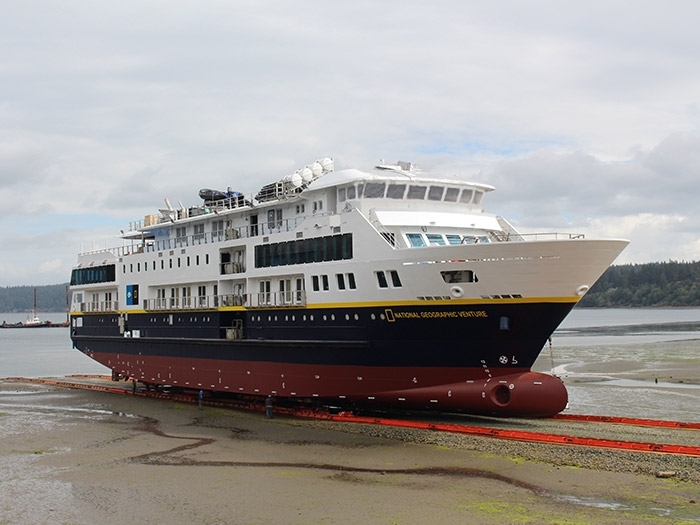 One of the Nautican’s latest projects is fabricating the first two sets of 104-inch nozzle units for the 120 ft Kirby Offshore Marine line haul tugs under construction at Nichols Brothers Boat Builders, Whidbey Island, WA. 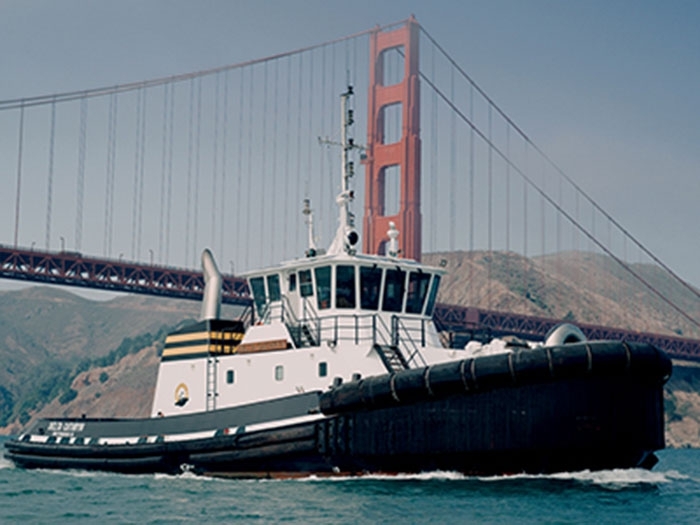 The designer of the ABS Class tugs is Jensen Maritime, Crowley Maritime Corp.’s Seattle-based naval architecture and marine engineering company. 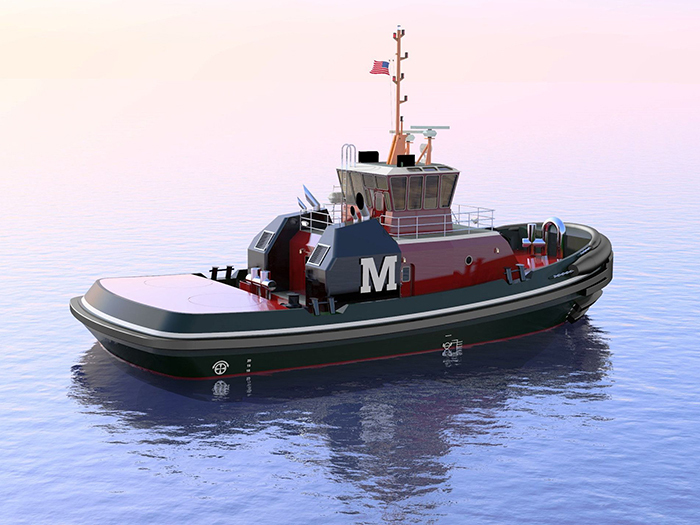 Each of the two tugboats will be equipped with two Caterpillar 3516C main engines, rated at 2,447 hp at 1,600 rev/min. 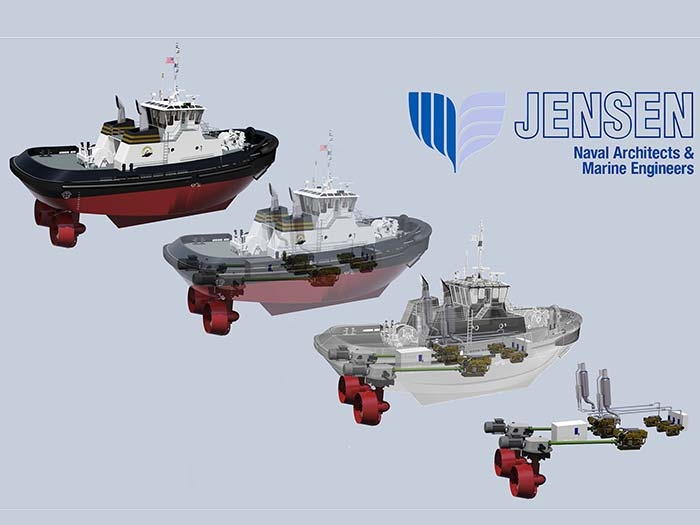 Reintjes reduction gears, supplied by Karl Senner, LLC, Kenner, LA, will turn two Nautican fixed-pitch propellers with fixed nozzles. 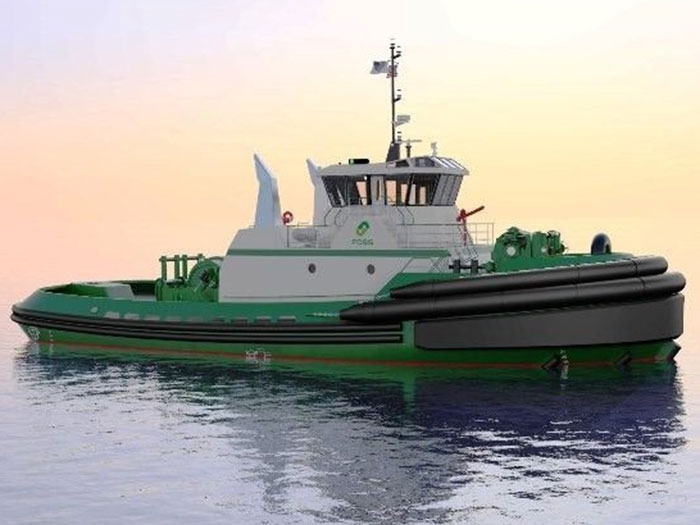 Other equipment onboard the tugs will include two C7.1 Caterpillar generators for electrical service, one TESD-34 Markey tow winch, one CEW-60 Markey electric capstan and one Smith Berger Town Pin. 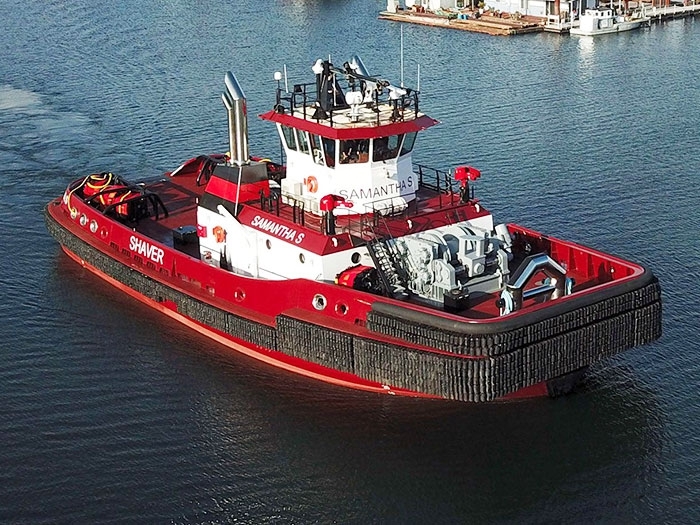 The 5,000 hp, twin-screw tug Phyllis Dunlap was built in 2001 by Hansen Boat Company, Everett, WA. Earlier this year, Wärtsilä expanded its transverse thruster series with the addition of the Wärtsilä WTT-40, with a 4,000 kW power level and a 3,400 mm diameter controllable pitch propeller. While Wärtsilä has designed and built customized transverse thrusters as powerful as 5,500 kW, the WTT-40 and others in the WTT range address customer needs for high power transverse thrusters for bow and stern applications. Development work on the Wärtsilä WTT-40 began in 2015 with an eye on targeting cruise ships, large OSVs and offshore construction vessels. The high power level is particularly important for the harbor maneuvering and docking of large ships, and for dynamic positioning of offshore vessels working in heavy sea conditions. Because of its maximum power of 4,000 kW, shipyards and cruise vessel designers have the option of using three WTT-40 thrusters instead of four smaller ones. This translates into a more efficient vessel design with less space required for the transverse thrusters. It also allows thrusters to be installed closer to the bow where they are more effective. Wärtsilä’s extensive experience with propeller design and tunnel optimizations using CFD analysis, ensures an optimal solution when it comes to propulsion performance, efficiency, and the minimization of noise and vibration. Another benefit of the Wärtsilä WTT-40 is its integrated hydraulics, which save machinery room space and installation and commissioning time at the shipyard. Military vessels such as patrol boats, corvettes, and frigates looking for “silent running” might well be interested in the Renk Advanced Electric Drive AED. The new drive from the Augsburg, Germany, plant offers a number of special advantages for shipbuilders, says Renk. The propulsion system is a real alternative to the heavy, space consuming electric motors that are rotating at propeller speed. Modern power electronics allow the use of high-speed motors in combination with an efficient gearbox. The Renk AED combines electric motor and gearbox on one joint frame. Built on soft elastic mounts and equipped with a highly elastic propulsion coupling an incomparably silent operation is possible. The water-jacket of the water-cooled electric motor as well as the double helical reduction gear add to extremely low noise operation. Thanks to the compact design as well as the low height the preassembled unit is quickly installed with minimum space requirements. Additionally there is a considerable weight advantage. The drive weights around 40% less than a conventional direct drive motor. By comparison, the Renk AED weighs only 23 tons instead of the 35 tons of a direct drive motor of the same power. Suitable for fixed pitch propellers as well as controllable pitch propellers the drive speed can be flexibly adjusted to the respective propeller requirements. The propulsion systems is built modularly and can be delivered in four sizes from 1.4 to 6 MW. For uses where the requirements are between sizes RENK simply adjusts the capacity of the bigger engine. In this way the complete range of capacities can be covered individually and economically. The motors work with low or mid ranged voltage and are designed –depending on size- for propeller revolutions of 190-450 rev/min. 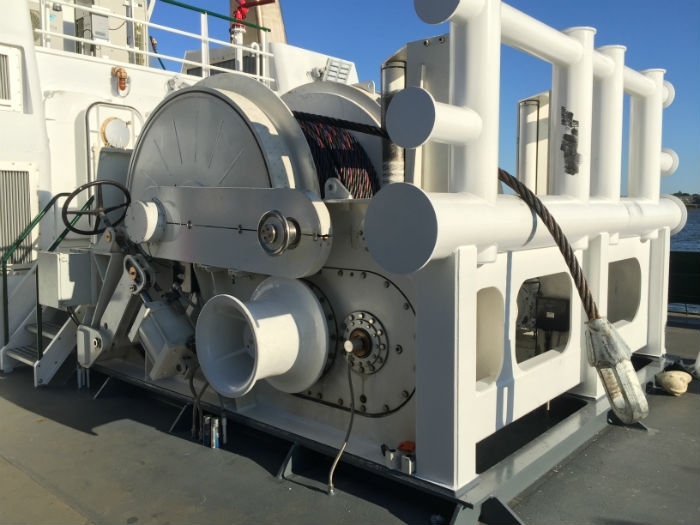 Besides pouring millions of dollars into research and development, marine propulsion manufacturers are also investing in new production and testing facilities. Earlier this year, Renk opened one of the largest and most modern test facilities in Europe for gear units at its headquarters in Augsburg. 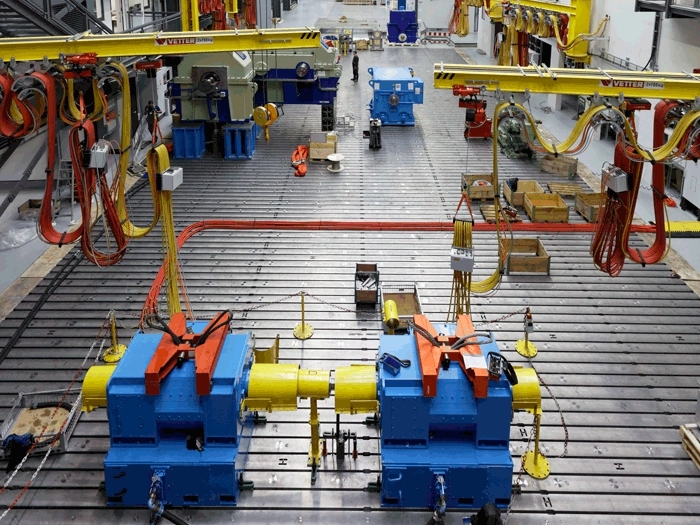 Whether for the shipbuilding, automobile or industrial sector: The multifunctional test facility is especially suitable for the testing of prototypes or special equipment. Renk will not only test its own special gearboxes and propulsion systems, but also those of other propulsion systems or propulsion component manufacturers. The test facility allows for a power capacity of up to 12 MW at 10 revolutions per minute and can take a torque of up to 11 million Nm. Just this past June, Rolls-Royce Marine unveiled plans for a EURO 57 million plan to upgrade its azimuth thruster plant in Rauma, Finland, and consolidate its thruster assembly and testing to one site. Rauma produces a wide range of mechanical azimuth thrusters for use on a wide range of applications including semi-submersible drilling rigs and drillships, tugs and offshore vessels. Rauma also produces thrusters for specialist vessels such as icebreakers and polar research ships. Azimuthing thrusters rotate through 360 degrees, providing propulsion and maneuverability without the need for a rudder. The largest and most powerful thrusters from Rauma are the ARC type which power icebreakers including the Finnish vessel Fennica. They are among the largest products produced by Rolls-Royce and can each weigh up to 190 tonnes, providing 7.5Mw of power. The heavylift vessel Pioneering Spirit, owned by Allseas, which is used for decommissioning oil platforms, has13 UUC thrusters; and Shell’s Prelude, the world’s first floating LNG production facility, will feature three large UUC thrusters, for position keeping. The thrusters are installed in a novel arrangement that allows them to be removed and maintained within the ship. The work to transform Rauma will begin immediately and is due for completion in 2020. The investment will include installation of a crane capable of lifting 200 tons, and at least six factory acceptance test rigs. Offices and IT systems will also be refurbished.